Khor Dubai is part of the Tentative list of UAE in order to qualify for inclusion in the World Heritage List. Does something like ‘Old Dubai’ still exist? Dubai only developed independently from Abu Dhabi from 1833 onwards. The origin of the city lies at Khor Dubai, the saltwater creek that flows through the city. From its small-scale port, pearl fishermen departed to dive off the coast and trade was driven with Asia and East Africa. The multicultural trading city with its skyscrapers that we now know dates from the seventies of the 20th century at the earliest. On my last day in the Gulf region I spent a few hot hours looking for the old core of Dubai. A WHS proposal for this zone has already been met with a ‘Rejection’ advice twice, leaving the international advisors in despair. The course of the creek through Dubai has often artificially been changed, extra land has been won and old neighbourhoods have been demolished. Getting it registered is a hopeless mission according to the advising committee, but hopes have been kept alive by the WHC which overruled ICOMOS to Deferral (2014) and Referral (2017) respectively. And the Emirates will not give up. I made a list of the named locations in both evaluation documents, and tried to find them on the ground using google maps and maps.me. This mission ended in a lot of searching for the remnants of old neighbourhoods like Al Fahidi and Bastakia, and the Souk al Kabeer. The 'largest Hindu temple of Dubai' must be in this area as well - but where? I did not manage to locate it. It turns out that a completely reconstructed 'new' old neighbourhood is being built on the banks of Dubai Creek. Partly they are still working on it (even on Friday, the 'Islamic Sunday'), but for the most part the buildings in old style are already standing. This neighbourhood is dotted with museums, cultural centres, restaurants, boutiques and other tourist attractions. Much is not open yet. If you look very closely, you can still find fragments of something really old, such as a few meters of the old city wall. The neighbourhood is now particularly popular with the large numbers of Asian workers who keep Dubai running. Only 15% of the 2.7 million inhabitants is a citizen of the Emirates. The rest comes mainly from Pakistan, India, Bangladesh, Iran and the Philippines. On Fridays they can enjoy each other's company here near the river, take a boat trip to the other bank for 1 dirham or eat an ice cream. I found Dubai in general very touristy, and to not offer much beyond shopping and cheesy / overpriced attractions. It felt like Kuala Lumpur without a soul. I cannot understand why some people choose to spend a whole week there. If you want an easy encounter with Arab culture close to Europe, please go for Morocco which has formidable WHS (and they will find you a camel to ride if you're adamant to have this 'experience'). I visited this tentative WHS in January 2015. Khor Dubai or Dubai Creek is a natural seawater inlet of the Arabian Gulf located in the heart of Dubai. It is 14 km long and varies from 100 to 500 m wide and ends at the Ras Al-Khor wildlife sanctuary (photo). The creek divides the city into two parts, namely Bur Dubai and Deira, and has played a major role in the economic development of the region throughout history. of global importance and a Birdlife Important Bird Area. 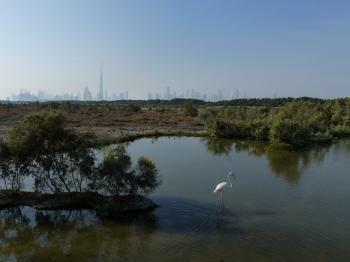 The peaceful panoramic view from the hides with the Dubai Skyscraper skyline in the distance is worth seeing. The historical importance of the Dubai creek is hard to grasp the closer you get to the noisy urban hotspot of Dubai apart from the wooden boats (dhows) which nowadays are powered by diesel engines and their berthing spots. Abras are smaller wooden boats powered by oar. Today these are equipped with diesel engines too and are still used to ferry passengers back and forth between Deira, Shindagha and Bur Dubai as well as for sightseeing harbour cruises with stops at the Gold Souk and the Dubai Heritage Village. Needless to say, I very much enjoyed the Ras Al Khor wildlife sanctuary which was a welcome peaceful place away from the bustling city of Dubai. I failed to appreciate any OUV but I'd gladly revist should I ever visit the UAE in the near future. The best way to see this river is by a cruise along the Khor Dubai. The river is a beautiful scean with heaps of interesting history behind it. Remember to take a hat and lots of suncream as the it it very hot!